The Best Music Classes for Children in East Hampton, NY. 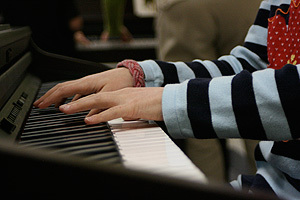 Early childhood music classes that lead to group piano lessons and musical fluency for all. Music Classes for young children and piano lessons are offered all year long at the Ellen Johansen Music Studio. Click here to find a musical adventure for your child. The music studio is light filled, air conditioned, and conveniently located in the Village of East Hampton, NY. This is the place to fall in love with music. Please look through our class offerings. Children love to be in my studio because they join other children and adults to dance, sing and play musical instruments. 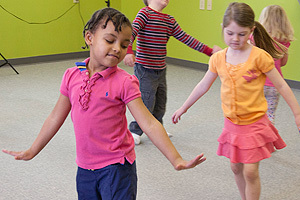 They are free to wiggle, jump, skip, sing and develop as children should through age-appropriate music activities as part of the Musikgarten Curriculum. The classes are small, not like the overcrowded classes at the libraries. The music material is the best offered on the East End. You will meet other families that value music in their lives and all together we hope to nurture and develop all the children in my classes to play and enjoy music throughout their entire lives. You can call Ellen for more information about the classes and to discuss which program is best for your child. Below is a small sample of a toddler music class. In this clip, I am sharing a popular finger play. Christine and Otto are LOVING his lessons with you. Otto actually smiles while practicing. It is so beautiful to see. "We tried that other music class in town and came back because we find your classes intellectually stimulating." -a daily question from many of my enthusiastic toddlers! We all enjoyed your program so much! What is truly amazing, is the fact that they all walked into the class and didn't know one thing about music. And look at them now. You did an amazing job! "Lillette woke up and twirled around singing "the north wind doth blow and we shall have snow and what will the robin do then? He'll keep himself warm inside of the barn and he'll hide himself under his wing. Poor thing. " I almost died from the cuteness. Thanks for giving her this gift. " © 2019 MUSIKGARTEN:: Ellen Johansen Music Studio All Rights Reserved.